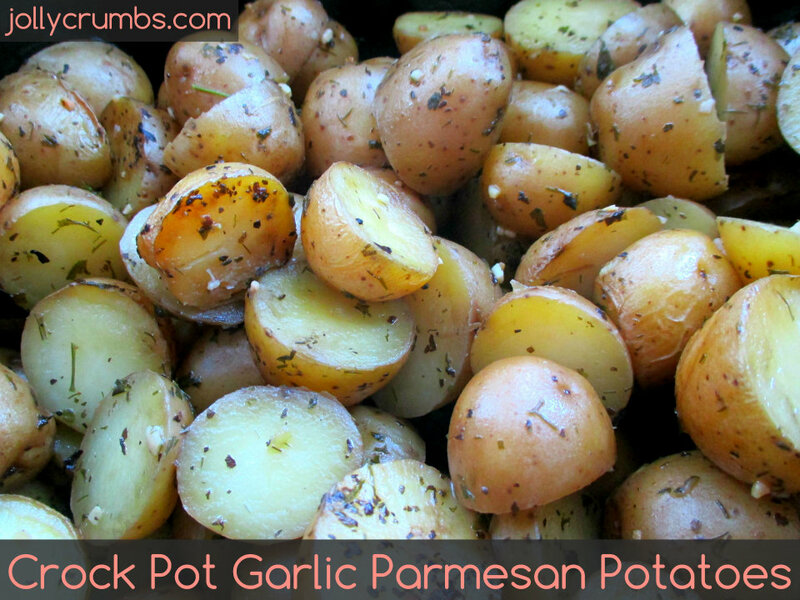 Before trying this recipe, I had never cooked potatoes in a crock pot before. I’ve seen recipes about making baked potatoes in a crock pot, but I have yet to attempt those. I love the idea of using the crock pot because it means I can use the oven for other things or leave it off to keep the kitchen cool on hot days. Well, I must say this recipe is perfect. There are so many positives to this recipe that I don’t know where to begin. It’s easy. This is a three step recipe. That’s it! 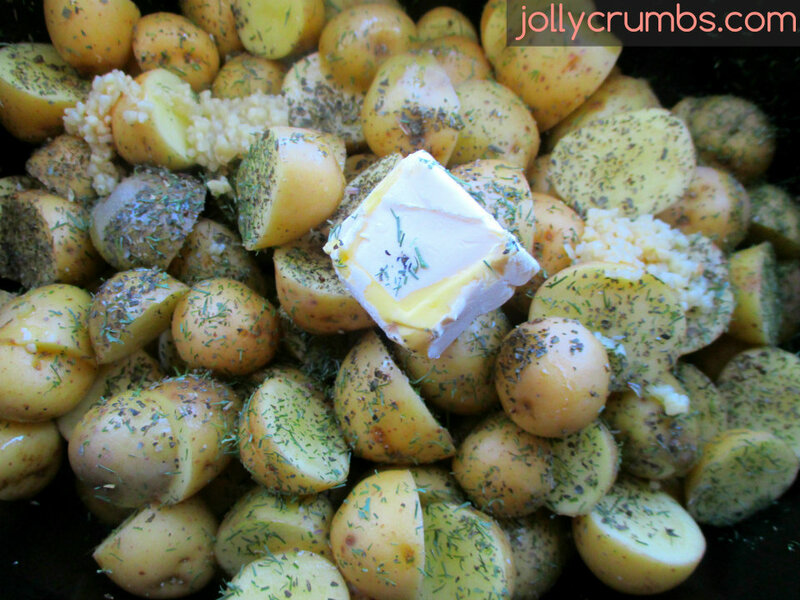 It also takes just a few hours for these little potatoes to cook up. The flavors are wonderful. These potatoes would go great with so many things; the possibilities are endless. I could go on and on, but really, you just need to make these. You won’t regret this one. The first step is to cut the potatoes into halves. If you have really little potatoes you can leave them whole. The goal is to make them all equal sized so they cook evenly. If you can’t find baby Dutch yellow potatoes, you can use any small potato. I baby red potato would also work, but make sure you cut them down into the smaller size. Once cut, place potatoes, olive oil, margarine, garlic, oregano, basil and dill into the slow cooker; season with salt and pepper, to taste. Give the potatoes a good stir to distribute the garlic, spices, and oil. Cover and cook on LOW heat for 4-5 hours or HIGH heat for 2-3 hours, or until tender. Serve immediately, sprinkled with Parmesan cheese. I told you this recipe was easy. You really don’t have to do much work to create a delicious side dish. I’m really impressed by how delicious these potatoes are. Some of the outsides get a nice little crisp, but the inside remains tender and fluffy. These are great little potatoes. I can’t recommend this side dish enough. It truly is one of the easiest side dishes I have ever made. Lightly coat the inside of a crock pot with nonstick spray. Place potatoes, olive oil, margarine, garlic, oregano, basil and dill into the slow cooker; season with salt and pepper, to taste. Give the potatoes a good stir to distribute the garlic, spices, and oil. Cover and cook on LOW heat for 4-5 hours or HIGH heat for 2-3 hours, or until tender. Serve immediately, sprinkled with Parmesan. You can use fresh herbs instead of dried if you would like. Just double the amount to be 1 tsp fresh oregano, 1 tsp fresh basil, and 1 tsp fresh dill. 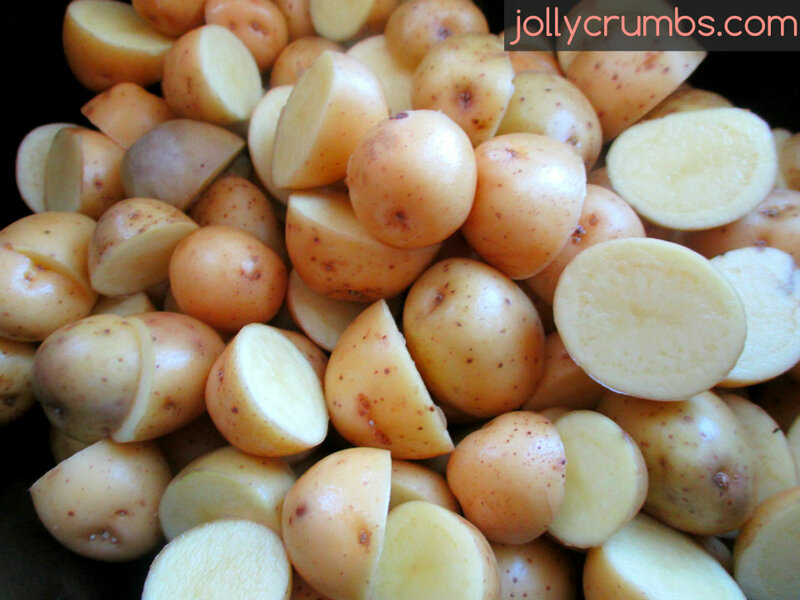 If you can’t find baby Dutch yellow potatoes, you can use any sort of small potato, such as a small baby red potato. These were so delicious! I tossed in a pinch of rosemary, too. They went so well with my baked ham. I will be making these again! They were a hit! I really like the idea of rosemary in these! I will try that next time! So glad you liked them.